Before and after screens. Click for a big version. Apache’s default directory index pages are ugly. 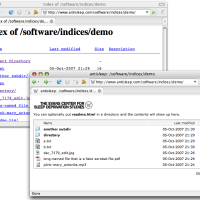 Indices is a set of hacks that makes them pretty, and more usable. View a demo index here. Unlike other PHP-based solutions, Indices is based on Apache’s built-in directory mechanism, so it’s pretty easy to seamlessly integrate it into your entire website. If you’re curious about the plumbing, read this blog post. 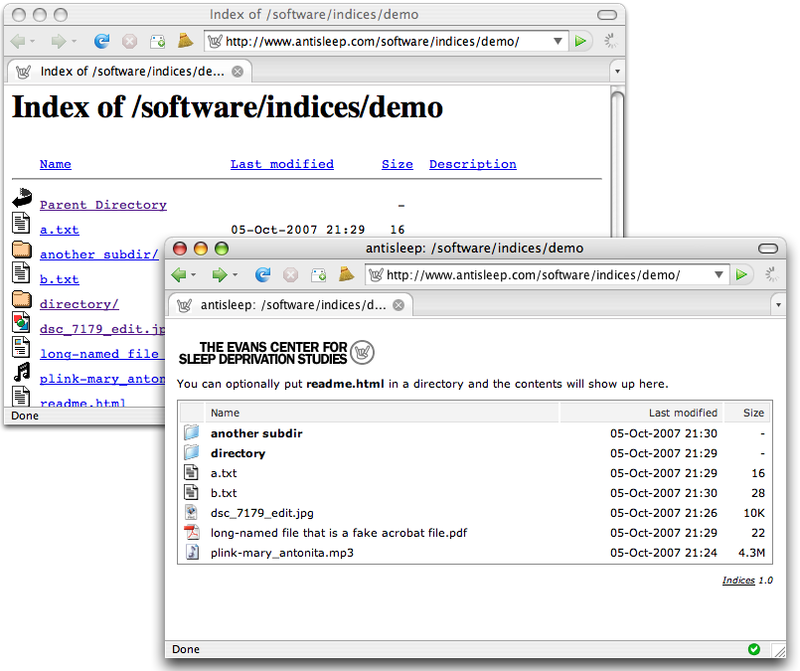 I developed Indices for my web server, which runs Apache 2.0.x and PHP 5.1.x. It’ll probably require some tweaking to get it working with earlier versions of either. If you’re running Apache 1, you’ll be able to use some of this code for inspiration, but you’ll need to do a lot more hackery. I love this as it’s very easy to use and is non-intrusive. Nicely done. Thanks for sharing your excellent solution. Is there anyway to specify folders or files to omit from the directory listing? @Steve – That kind of thing should be done with Apache configuration; Indices’ purpose is to style Apache’s output. @gse – Thanks. I should have searched Google first. IndexIgnore is what I needed. …to the start of the .htaccess file. Thanks for your effort in a great bit of code. Couldn’t figure out how to fix it either. Nevermind… figured it out. It’s just hidden in the CSS. Bad call if you ask me. Thx for the nice work with this! I did everything as the instructions say… yet it doesn’t seem to do anything. I added the indices directory to my website’s root directory, and renamed main-htaccess to .htaccess (i had nothing in my .htaccess previously so it shouldn’t cause an issue). Do I need to modify my httpd.conf file? Because that’s empty for me. Sorry, I’m newish to the whole apache2 thing. @adlwtn – Hard to say what’s going on. Be sure you have htaccess files enabled in your Apache config? Maybe ask a friend who’s an Apache expert to help you out. Sorry but I don’t have much time to support Indices. The zip contains a subdir called indices, make sure that and not the indices-1.1 is in your docroot. The .htaccess file should be copied to the directory you’re planning to pretty index. Odd that you’re main Apache config is blank. Double-check this. Normally /etc/apache2/apache2.conf on modern Linux-systems. The other possibility is that the main config file, or vhost file/config, has “AllowOveride None” somewhere as this would preclude the use of .htaccess files. Generally I think it is better to use the main config file rather than .htaccess unless there is a good reason not to. @gse – thanks very much for writing this. I sent an email just now with some feedback. Wanted to thank you. I’ve been using this for some time now and it really pretties up the mess. Thanks for sharing this wonderful code! I’ve added the code as described. Everything is working except, there’s always one folder missing. It’s always the first folder on top. When I sort folders by name it’s just the opposite. The first folder is visible and the last folder is hidden. Is there anything I can do? Tom: Your problem might be that the css specifies that the first row of the table shouldn’t be shown. I ripped out the static CSS because I was having problems with php, and i noticed the same thing. I imagine the php file itself is supposed to determine when it’s in the root of the domain (therefore there’s no parent directory link) and not include that CSS, but it’s probably broken for you. I am using Indices on my “local” development work station and on my website. I have different issues with both; so there must be some apache conf issues. Fore example, I got my “local” working except the parent directory link does not show… my workstation shows the parent link but the css definitions don’t work. Both use the same setup! The above line obviously does not include the three specific files given by name. The last definition “! *” will not display a file or directory that starts with an exclamation mark – which is how I had my private information. 2) If your .htaccess is setup in your doc root, *** remove the .htaccess in the “indices” folder *** or they will have conflicts. So simple & cool with your help, serious work, many thanks ! if a directory before had its own header.html file, how can we get it to include this info or overide the default indices info? Why I have “php code” embedded in my HTML? In particular, seems that header..php and readme.php are found but are called like Static HTML files and not processed by php preprocessor…. Hi there! Does this work out of the box with Apache 2.2.x? No idea, but it’s easy to try it and see. Probably. any idea on how to get this to work on a mac with MAMP 2.0? I moved indices to /extras and modified /extras/httpd-autoindex.conf and nothing happened. since my installation does not support them. This rocks. I idly downloaded it, read and followed the README, hit a directory that gives a directory list, and wham! a neat listing in Arial. I dumped the .htaccess file in a virtual directory that does directory browsing and it even worked there. This is on a XP box running XAMPP, with scarcely any configuration post-install. Love it! I’m sure there’s a nice way from the htaccess directory to hide the /indices folder, no? Not knowing the “right” way to do it, I renamed indices to .indices and changed all the paths in .htaccess accordingly. Thanks for putting this out there. Turns a hackey file browser into something much more livable. This is very cool. Just wondering if you have managed to get it to show a default favicon.ico , I have tried everything I can think of. Tested in Safari 5, Opera, FF10, and IE9 and it seems to work OK.
Hopefully someone finds something there they like. (Otherwise, works for me so I’m happy). Holy crap, that is great! I’ll update this page to point at yours when I have a chance. Is there any way you could translate the whole htaccess into an instruction to use with nginx? Great piece of code – thank you for sharing! Just wanted to record that for posterity :) Thanks again. Hello!Thank you for your effort! Is there any way of traslating or changing the header row cells from the table? I mean the Name , Last Modified, Size. I want to show this 3 strings to another language.